The doors of the event open at 3pm, with local Rock Bands and Performers playing throughout the event. After years of supporting the local art and music scene, the rocker Andy Durand faces an uphill battle with 3 types of cancer. This Benefit will be a day of celebrating Andy Durand as much as it will be meant to raise funds for his support. We are still seeking donations and raffle prizes and hope that everyone will share the gofundme page that will remain active for many months to come so that donations can continue into the future. With everything our neighbors are going through after the Hurricane and with holiday season pending we understand it is a tough time to give. With this in mind we want to ask everyone to share Andy’s gofundme page and encourage donations such as gift certificates, discounts for services, artwork and more. 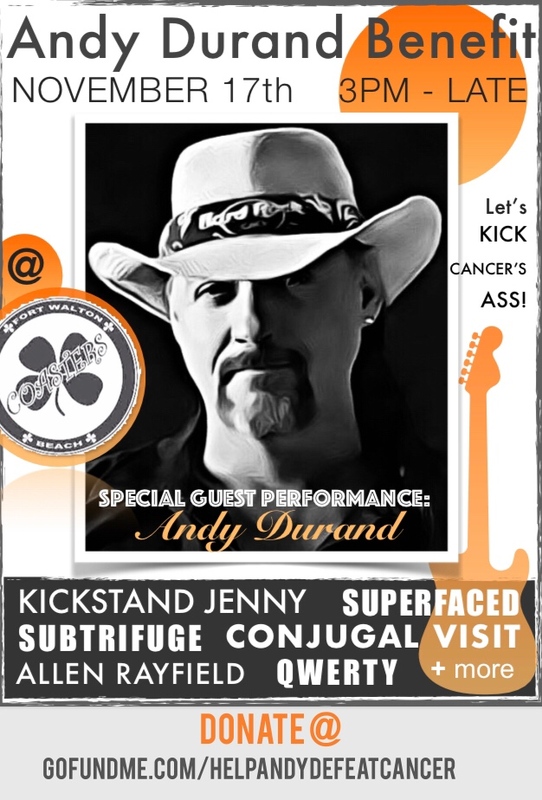 Special Guest Performance: Andy Durand! This entry was posted on November 12, 2018 by 850music in Posts and tagged press release.